Dietitians say there’s much to learn from other countries when serving this most important meal. Take a snapshot of the breakfast your client is about to enjoy and it may showcase different shades, textures, and ingredients, depending on what corner of the world they’re from. There’s no one picture of the “perfect” breakfast in terms of health, and meals will vary based on preferences within families, communities, and regions in a particular country. Yet most would agree that when comparing nutrient profiles of the morning meal among nations, the majority of breakfasts eaten in the United States aren’t likely to rank high on the list of healthfulness. In VanBeber’s view, the more healthful versions of breakfast that clients enjoy in the United States can include whole grain breads with low-fat cheese or nut butter for a nutrient-dense carb with a good protein source or low-fat yogurt combined with fruit for a combination of protein, fat, and carbohydrate. Stepping outside this country’s borders can open up a whole new world of breakfast offerings. 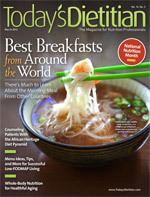 In this article, Today’s Dietitian asked RDs with the knowledge of world cuisine—whether through personal experience or research—for their picks of countries that offer some of the more healthful breakfasts from around the globe as well as their thoughts on what Americans can learn from these regions and how they might incorporate these foods and traditions into their own morning meal, stateside. Ann Diker, PhD, RD, an assistant professor of nutrition and chair of the health professions department at Metropolitan State College of Denver, says Turkey is one country with breakfast traditions worthy of bragging rights. Diker, whose husband is from Turkey and who travels there regularly, says the healthfulness of the traditional Turkish breakfast stems from its inclusion of vegetables, olives, honey, and tea. A typical Turkish breakfast will include cucumbers, tomatoes, olives, feta cheese, honey or jam, French bread, and tea, with eggs or sucuk (spicy lamb sausage) thrown in a few times per week, Diker says. In addition to the nutrition-packed fare traditionally eaten in this country, Diker says Americans can learn from some of their other eating habits. For example, Turkish families make it a point to eat together—even at breakfast—whereas the fast-paced routine of Americans makes it even difficult to get everyone at the dinner table a few nights a week. While this may be a stretch for many families in the United States, dietitians can suggest clients adopt a simpler habit to make their morning meal a bit healthier: eat more vegetables. “Try including some vegetables at breakfast by simply slicing some tomatoes and cucumbers. Drizzle them with a little olive oil if desired, sprinkle with salt and pepper, and enjoy,” Diker recommends. Although Brigitte Kochavi, RD, now calls Israel her home, she was born and spent her early years in France. When comparing the different breakfast traditions of Europe and the Middle East, Israel comes out ahead for healthfulness, says Kochavi, who’s head of pediatric clinical dietitians for Edmond and Lilly Safra Children’s Hospital at Sheba Medical Center in Ramat Gan, Israel. Referring to the traditional Israeli breakfast as healthful, natural, and simple, Kochavi says it’s almost impossible to find meat on any breakfast plate in Israel, partly due to Kosher laws that require dairy and meat products be kept separate. Instead, Kochavi says many people choose to eat fish such as herring, smoked salmon, or mackerel, adding some healthful omega-3s into the diet first thing in the morning. “The typical Israeli breakfast usually consists of the Salat Katzutz, or chopped vegetable salad,” Kochavi explains. This meal generally includes tomatoes, red onion, parsley, cilantro, and seedless, crunchy cucumbers, with red or green peppers on occasion. All ingredients are finely chopped. Unlike most salads in the United States, Salat Katzutz is served without salad dressing, nixing the added calories customary of most American salads. Cheese is usually a part of one’s breakfast in Israel, either Tsfatit, which is white cow’s milk cheese named for the Israeli city of Tsfat, or cottage cheese, Kochavi says. Other traditional breakfast foods include yogurt, hummus and tahini with olive oil, pita or fresh bread, and hard-boiled eggs, olives, avocado, and fresh juices. “The Israeli breakfast is low in saturated fat and high in monounsaturated fat and dietary fiber,” Kochavi says. When asked what she thinks Americans can learn from Israel’s breakfasts, she suggests taking note of kosher traditions and swapping fish for meat for the first protein source of the day. “Instead of meat or bacon, eat fish or egg, which are also good sources of protein,” she says. Malena Perdomo, MS, RD, CDE, an adjunct professor at Metropolitan State College of Denver, proclaims Costa Rica as a country with breakfast benefits engrained in its culture. “Costa Rica loves the dish gallo pinto for breakfast, which is rice and black beans and eggs on the side,” she says. “This breakfast will last for several hours, and you will be able to work nonstop until lunchtime,” she says, noting that many people in this country do just that. This country’s breakfast is also high in fiber, another reason for its healthfulness. “[People living in Costa Rica] aren’t eating sweet rolls or sweets for breakfast. Instead, they’re eating protein, fiber, and complex carbohydrates,” with most enjoying fresh fruit or a small glass of fresh fruit juice to round out the meal. Patricia H. Terry, PhD, RD, LD, a professor and director of the didactic program in dietetics at Samford University, who has traveled extensively and who currently is teaching a class in Costa Rica, also believes the country has much to teach about breakfast. Terry explains that the Nicoya Peninsula of Costa Rica is one of the “Blue Zones,” which are parts of the world that have been studied due to their populations living measurably longer on average compared with other countries. She says the typical Costa Rican breakfast includes lots of pineapples, oranges, mango, papaya, corn, beans, rice, squash of all kinds, fresh cheese, and eggs—foods likely to be foreign to Americans at breakfast time. “Fish, vegetables, soup, and nuts for breakfast? Yes, and much more,” Terry says. “Why? Because it’s not what foods you eat for breakfast but the nutrients in those foods that are important,” she says, adding that this is one habit Americans might do well to adopt to improve their lifestyle. While Perdomo says slowing down to enjoy a regular breakfast is one way to incorporate Costa Rican traditions into Americans’ lives, her suggestion for using last night’s leftovers could be more feasible for time-crunched families. “For example, the Costa Rican breakfast of rice and black beans are made with leftover rice and beans. We can be reminded of how to throw less food away and use everything that we cook and eat it for breakfast,” she says. Keefe is coauthor of the Eat Well China app, a nutrition/travel app for smartphones and the iPad, which has a whole section devoted to the healthful aspects of the Eastern diet. She says a typical Chinese breakfast might consist of a dumpling or bun filled with vegetables or meat, along with a cup of soymilk tea, or a soupy rice porridge called congee. Keefe says both of these breakfast choices are low in fat and sugar and allow for an early opportunity to incorporate vegetables into the daily diet. For Americans looking to behave more like the Chinese at breakfast time, Keefe advises stepping away from the assumption that breakfast equals sweetness. “I think Americans need to try having vegetables for breakfast and incorporating different kinds of protein in their morning meal,” Keefe says. “Also we could benefit from giving up the idea that breakfast foods should be sweet. “For an American-style jian bing, take a crepe and fill it with a fried egg, green onions, and chili sauce, then wrap it all together and you’re good to go,” she suggests. Keefe says congee, Chinese rice, could be made healthier by using brown rice and adding dried fruits as well, noting that congee is great for those short on time, as it can be easily made in a slow cooker. In Venezuela, as well as in other Latin American countries such as Colombia, Ecuador, and Perú, the high consumption of corn is a big part of what gives this cuisine high marks. “[Corn] has been a good source of nutrients as well as fiber when it’s been used from scratch to make bread, tortillas, or arepas,” says Marianella Herrera, MD, MSc, an assistant professor at the Universidad Central de Venezuela, president of the Venezuelan Scientific Society for Obesity, and Venezuela country representative for the AODA. A Venezuelan breakfast often includes baked corn flour bread called arepas, which are filled with cheese, fish, beef, or chicken, or eaten as a side with shredded beef, black beans, white cheese, avocados, and/or fresh fruit juices. “So we have good sources of protein, carbohydrates, dairy, fruit, and fiber,” Herrera says. She notes that arepas offer a great gluten-free fiber source, with avocados providing beneficial polyunsaturated fatty acids. Typical fillings of shredded beef and chicken are good sources of protein, with shredded fish offering some extra omega-3s and phosphorus. Black beans, also a mainstay of this country’s breakfasts, contain flavonoids, fiber, and folic acid, and the white cheese typically eaten with this meal is a great source of calcium. To round out the meal, Venezuelans enjoy fresh fruit juices such as papaya, mango, watermelon, orange, tangerine, cantaloupe, or pineapple, all of which add their own array of vitamins. Herrera suggests RDs discuss the benefits of fresh fruit juices with clients looking to adopt a Venezuelan breakfast tradition, noting that fresh fruit juices (emphasis on fresh) can provide a great way to obtain one’s daily fruit requirements while avoiding the added sugar from premade juices. According to VanBeber, who has extensive travel experience and teaches a food and culture course at Texas Christian University, some of the healthiest breakfast habits lie in southeast Asia. “The southeast Asian countries, including Vietnam, Cambodia, Laos, and Thailand, consume healthful breakfasts that include a bowl of noodles,” she says. VanBeber explains that the traditional soup of Vietnam, pho, is broth based and includes rice noodles as the base, with a condiment of protein such as chicken, meatballs, beef, or pork as well as a plethora of vegetables and herbs, including basil, cilantro, bean sprouts, carrots, cucumber, and lime. Dina Aronson, MS, RD, part of the advisory counsel for FitOrbit, whose global breakfast knowledge is based primarily on her education and research, also says Asian countries tend to have breakfasts healthier than most. “Their breakfasts almost invariably include vegetables, while sweets—if they make an appearance at all—play only an accompanying role,” she says. Clients who are open to eating noodles for breakfast “can plan this by making extra for dinner the night before,” VanBeber says. “Don’t be afraid to eat foods for breakfast that we might consider lunch or dinner foods. These foods often have a better combination of protein, carbohydrate, and fat than the common breakfast, which consists of processed cereal,” she adds. Whether it’s cooking noodles the night before or simply slowing down to eat and enjoy the 7 AM eating routine, Aronson says the most important message to take away from exploring other cultures’ traditions is that a healthful breakfast is possible for everyone—and whatever healthful habit clients are willing to adopt is the best one. 1. In a bowl, combine salt and flour, then add the water and oil and stir all the ingredients until homogeneous. Work the mixture by hand until smooth. preferred size of arepas. Shape each piece into a small ball, then work the balls until they are in the shape of a disc. Put the arepas in a hot pan previously sprayed with oil and let them cook at medium temperature, flipping once, for 6 to 8 minutes, or until firm. Arepas should be slightly golden and crispy on the outside and smooth inside. 3. For children, you may use carrot juice or spinach juice to add colors to arepas. 4. Fill them with cheese, ham, turkey, beef, etc. Farmer’s cheese is a type of soft, white, unripened cheese that’s made all over the world. Goats, sheep, and cattle all provide milk for farmer’s cheese, which also can be made from the milk of more exotic animals such as yaks. Many grocers and dairies sell the unaged white cheese, which is suitable for a wide range of uses. Since the cheese is quick and easy to make, it’s been traditionally associated with farmers, who originally made it for home consumption only. 1. Pour the milk into a large pot and stir in a pinch of salt. Bring to a boil over medium heat, stirring occasionally to prevent the milk from scorching on the bottom of the pot. 2. When the milk begins to boil (small bubbles will first appear at the edges), turn off the heat. Stir lemon juice into the milk, and the milk will curdle. You may need to wait 5 or 10 minutes. 3. Line a sieve or colander with a cheesecloth and pour the milk through the cloth to catch the curds. What is left in the cheesecloth is the Farmer’s Cheese. The liquid is the whey. 4. Gather the cloth around the cheese, and squeeze out as much of the whey as you can. 5. Wrap in plastic, or place in an airtight container. Store in the refrigerator.